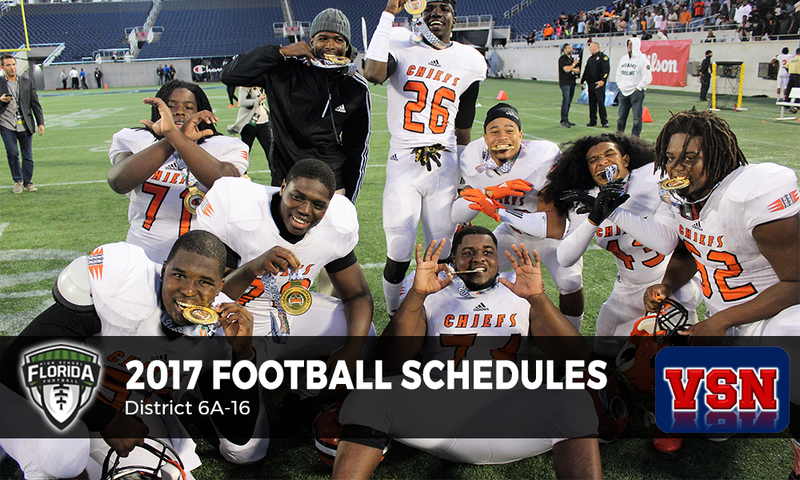 Here are the 2017 football schedules for District 6A-16, Presented by Varsity Sports Network. All kickoff times are 7:30 p.m. Eastern unless noted. • Week 1 — Sat. Aug. 26 — @ Miami Palmetto at Southridge, 7:00 p.m.
• Week 2 — Thu. Aug. 31 — Miami Jackson at Hialeah-Miami Lakes High, 4:00 p.m.
• Week 6 — Wed. Sep. 27 — @ Miami Carol City* at Traz Powell, 7:00 p.m.
• Week 8 — Sat. Oct. 14 — Miami Central,* 7:00 p.m.
• Week 9 — Thu. Oct. 19 — @ Miami Norland* at Traz Powell, 7:00 p.m.
• Week 3 — Sat. Sep. 9 — @ Columbus at Tropical Park, 7:00 p.m.
• Week 4 — Thu. Sep. 14 — @ Miami Norland* at North Miami, 7:00 p.m.
• Week 5 — Fri. Sep. 22 — @ Dr. Krop at Ives Estates, 7:00 p.m.
• Week 6 — Wed. Sep. 27 — Hialeah-Miami Lakes,* 7:00 p.m.
• Week 8 — Sat. Oct. 14 — @ Miami Northwestern,* 7:00 p.m.
• Week 9 — Sat. Oct. 21 — @ Booker T. Washington, 7:00 p.m.
• Week 11 — Thu. Nov. 2 — @ American, 7:00 p.m.
• Week 1 — Thu. Aug. 24 — Chaminade-Madonna, 7:00 p.m.
• Week 2 — Thu. Aug. 31 — Booker T. Washington, 7:00 p.m.
• Week 4 — Thu. Sep. 14 — Miami Edison, 7:00 p.m.
• Week 6 — Thu. Sep. 28 — Miami Norland,* 7:00 p.m.
• Week 7 — Fri. Oct. 6 — @ Blanche Ely, 7:00 p.m.
• Week 8 — Sat. Oct. 14 — @ Hialeah-Miami Lakes,* 7:00 p.m.
• Week 4 — Thu. Sep. 14 — Miami Carol City,* 7:00 p.m.
• Week 5 — Sat. Sep. 23 — @ American at Milander, 7:00 p.m.
• Week 6 — Thu. Sep. 28 — @ Miami Central* at Traz Powell, 7:00 p.m.
• Week 9 — Thu. Oct. 19 — Hialeah-Miami Lakes* at Traz Powell, 7:00 p.m.
• Week 3 — Sat. Sep. 9 — South Dade, 7:00 p.m.
• Week 6 — Sat. Sep. 30 — @ IMG Academy, 7:00 p.m.
• Week 8 — Sat. Oct. 14 — Miami Carol City,* 7:00 p.m.